The body of Johnson, who died Wednesday at 94, was carried to the library in a natural wood casket that was covered with the former first lady’s beloved wildflowers. 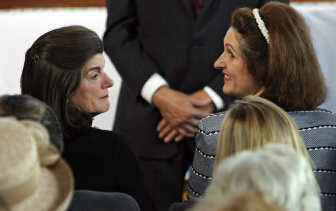 Daughters Luci Baines Johnson and Lynda Robb marched a few steps behind, holding the hands of their husbands, Ian Turpin, of Austin, and former Sen. Charles Robb of Virginia. For Rick Scott, vacationing in Texas from his home in El Dorado, Kan., it was an opportunity to witness history and reconnect with his youth. “Growing up in the ‘60s, the Kennedys and Johnsons were big parts of our lives,” said Scott, 53. Lady Bird Johnson’s body was to lie in repose all day at the LBJ Library. Earlier in the day, there was a private service at the wildflower center in South Austin that bears her name. Today, dignitaries including former Presidents Jimmy Carter and Bill Clinton and their wives were among those expected at the formal service at an Austin Church. Lady Bird Johnson, who died at 94, will be buried Sunday alongside her husband at the couple’s ranch.